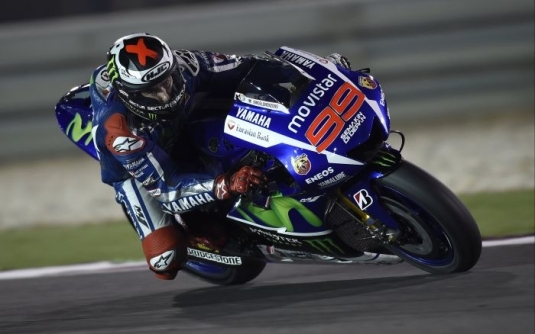 Movistar Yamaha MotoGP’s Jorge Lorenzo and Valentino Rossi completed the second night of preseason testing at the Losail International Circuit in Qatar this evening, finishing in fourth and fifth place respectively. Beating the crowd, Jorge Lorenzo was one of the first riders to leave the pits and face the slippery circuit. Though today’s conditions were cool and overcast the competition soon heated up when he was joined by the rest of the field. Lorenzo positioned himself as a key protagonist with a 1’55.500s lap and slotted into second place in the time standings. He spent the remaining time of the session concentrating on a race set-up and finished the day in fourth place, +0.593s from the front. Teammate Rossi followed the trend and waited until just after 6pm to hit the track. He continued working on the technical setup of his YZR-M1 and posted a 1’55.983s lap. As the day progressed so did his feeling with the bike and he was able to improve his time to 1’55.581s and take fifth position in the standings, +0.674s from the front, directly behind his teammate. With today’s progress, Lorenzo and Rossi also hold fourth and fifth place respectively in the combined session time sheets. Monster Yamaha Tech3 Team rider Bradley Smith showed his determination to finish in eighth position on the second day of testing at the final preseason outing. The young British rider dug deep throughout the session under the floodlights to post a top time of 1’55.648 after completing a total of 49 laps around the Losail International circuit. His result left him fractionally behind fourth position with a gap of just 0.148 as he continued to improve by cutting his lap time by three tenths of a second. This leaves the 23-year-old rider fully charged and primed to resume his performance tomorrow in the final day of testing. Meanwhile Pol Espargaro shot to ninth position after a rapid run in the desert, leaving him with a best time of 1’55.658, which was only 0.010 behind his teammate. The 2014 MotoGP rookie of the year successfully addressed the front end issues that he faced yesterday and completed a total of 46 laps, as he set his best time mid way through his day on the 29th lap. His leap in performance was illustrated by notably cutting a whole second from his time set yesterday. In addition, his result was a blink of an eye behind fifth position by a mere eight hundredths of a second, which leaves him confident for further progress tomorrow. Today’s testing session at the Losail track ended prematurely for Stefan Bradl due to a bad crash, luckily without consequences. The German, who had just got on the tarmac suffered a violent impact on the ground and was taken to the Medical Center of the circuit. After the doctors had excluded any possible complication, he was brought to the Clinica Mobile where he remained under observation for a while before deciding not to let him go back on track and complete the today’s test session. Bradl will almost certainly be on track tomorrow to try to make the most of the last day of testing. It was a full day for his teammate Loris Baz who completed 40 laps with a personal best of 1.56.936. The Frenchman continued his work program in view of the season premiere, he remained focused on race pace and he tried several new solutions.